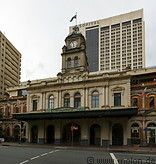 Brisbane has retained some heritage buildings dating back to 19th century colonial period. The Old Windmill, in Wickham Park, built by convict labour in 1824, is the oldest surviving building in Brisbane. The Conrad Treasury, the Old Executive building and a number of churches are other examples of colonial era buildings.